A little slice of paradise that is untouched by large scale development and celebrates a relaxing lifestyle, Gulf Breeze, FL is a quiet residential town situated just minutes between the Gulf of Mexico and the city of Pensacola. With access to the water, city and holding a charm of its own, there is no question as to why so many people want to make Gulf Breeze their new home. A suburb city of Pensacola, Gulf Breeze sits as a small town that boasts a big nature draw. One of the largest attractions within the city is the highly recognized Gulf Islands National Seashore. This nationally protected park is spread over three Florida islands and incorporates the views of old-time Pensacola and magnificent natural and oceanic sights. Perfect for snorkeling, hiking, camping, bird watching and water activities, the inviting beaches are perfect for the laid-back lifestyle and family time. Environmentally aware and historically centered, Gulf Breeze focuses on preserving all the sights and stories that makes it unique. Accommodating to those who reside in the community and those who frequent it, Gulf Breeze commits to making the area as inviting and as beautiful as possible by efforts to keep the environment clean and healthy, as well as artistically captivating, with public displays of sculptures, art, and other pieces that exhibit culture, identity and narrative of the community. Aspen Square offers luxury living on the Emerald Coast at an affordable price. The Fairpointe at Gulf Breeze apartments features spacious one bedroom and two bedroom open concept floor plans with incredible amenities available to all residents. All floor plans include washer and dryer appliances within the apartment, fully equipped and renovated kitchens with stainless steel appliances, white cabinetry and granite-style countertops. Residents at The Fairpointe enjoy gorgeous natural lighting in every home in addition to their choice between luxurious wood-style flooring and plush carpeting. When it comes to storing your belongings, you’ll find that the closets in the apartments have built-in shelving so you can stay organized. Have some bigger items? Use one of our outdoor storage closets to help you keep your belongings safe. With central air and heat and multi-speed ceiling fans, you’ll always be comfortable in your home no matter the weather. Outside of your Gulf Breeze, FL apartment, the luxury continues! Beautifully landscaped grounds can be viewed from your private patio, or you can explore the community and enjoy the resort-style swimming pool, state of the art fitness center, tennis court, hammocks, grilling and picnic area and bark park! That’s right… we even have an on-site dog park with agility obstacles! Our community offers pet friendly Gulf Breeze, Florida apartments and encourages you to bring all members of the family,including your fluffy ones! We are committed to making our apartment community feel like home from the moment you move in. What a better way than welcoming all members of your family? When it comes to recreation, you’ll always find entertainment nearby. Our sparkling resort-style pool is a great place to relax, or if you’re looking for something extra relaxing, find a hammock nearby and lay back. For the the kiddos we have a playground for sliding, climbing and more. If you’re looking for games, we have complimentary tennis racquets available as well as bags for our corn hole boards. If you’re looking to get in shape, there’s no need to pay extra for a gym membership, because there’s a fitness center on-site with cardio equipment, cycling bikes, free weights, a yoga studio and strength training equipment. 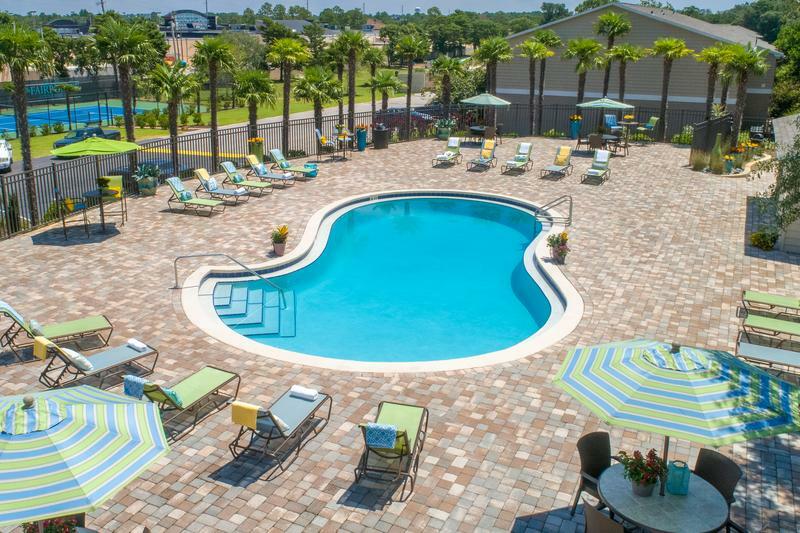 If you are looking to call Gulf Breeze, Florida your new home, The Fairpointe at Gulf Breeze has everything you need. Call our team today to schedule a tour of our apartments for rent in Gulf Breeze, Florida at The Fairpointe and begin discovering what it is like to live the true Aspen way.